A bot team is a team without an owner. Either the owner has left the team, or the team is still waiting for its first owner. These teams play with nearly useless players and a random line-up each week. They tend to relegate down the divisions so that the team can get a new owner. In the bottom two divisions, teams will be replaced as soon as a replacement owner becomes available. In some leagues this is almost immediate, whilst in other countries, it can take several weeks. In the higher divisions if a team becomes ownerless (deserted by its human user) it will continue to use the standard lineup until this lineup is reset automatically. Such a reset is made 3 times each season: before the mid-week games of Week 1 (the first cup game), Week 8 (mid-season), and Week 15 (the qualifying games). When the reset is made, the team will become a bot team, playing all games with the same (low skilled) players. Ownerless teams will thus be relegated through each series until they reach one of the two lowest divisions, where they can get a new owner. Lineup resets only apply to teams that have lost their owner, not to teams that never had one. 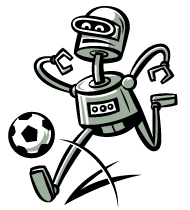 Bot were introduced in December 2005. Previously teams in the higher divisions that did not have human owners gave a Walk Over every week. before the 1st round of the Cup. after the 7th round of the league. after the 14th round of the league. Since 2009-11-23, bot teams are demote to the lowest possible division at each season’s end, and prevent from promoting. Instead, non-bot team will promote "for free" and take their place higher up in the league pyramid. This system is valid from division VI and down (bots in div V and up are not affected). This page was last edited on 19 December 2013, at 23:51.